Gestational diabetes occurs when you have hyperglycemia (high blood glucose levels) during pregnancy. Gestational diabetes usually develops in the third trimester (between 24 and 28 weeks) and typically disappears after the baby is born. Women who develop gestational diabetes during pregnancy are more likely to develop type 2 diabetes later on in life. Finding out you have gestational diabetes can be very frightening as not only do you have to deal with all the emotions (the ups and the downs) and the questions that come with being pregnant, but also the uncertainty of this new-found condition. Fortunately, as with all types of diabetes, there are many well-informed health professionals to help answer your questions and to guide you through this very important time in your life. The more you know, the easier it is to accept and make the necessary changes for a successful and happy pregnancy. How did I get gestational diabetes? Somewhere between 24 and 28 weeks into your pregnancy your doctor most likely sent you to be screened for the presence of gestational diabetes. If you were at greater risk for getting gestational diabetes, your doctor may have sent you for a screening test before you reached 16 weeks. You may think this is too late in your pregnancy to be finding out about such a problem, but in most cases, screening before this time would be of little value. It is the hormonal changes (hormones made by the placenta that resist insulin) in the second and third trimesters of pregnancy, along with the growth demands of the foetus, that increase a pregnant woman's insulin needs by two to three times that of normal. Insulin is needed to take the sugar from your blood and move it into your cells for energy. If your body cannot make this amount of insulin, sugar from the foods you eat will stay in your blood stream and cause high blood sugars. It occurs in 3-5% of all pregnancies (in other words, 1 in 20 pregnant women will develop gestational diabetes); so, you can take comfort in the fact that you are not alone. Gestational diabetes is a form of diabetes that comes on during pregnancy. It is believed to affect as much as 1 in 7 pregnant women. Often diabetes will go away after your pregnancy but can come back later on in life as type 2 diabetes. Your is high if you have had gestational diabetes previously. Because keeping blood sugar levels in check during pregnancy is very important, you should receive an antenatal screening for gestational diabetes which will pick up any abnormalities in blood sugar levels. Should diabetes come on between screening appointments, the symptoms may be recognised as feeling thirsty; having a dry mouth, needing to frequently urinate, tiredness, having yeast infections. For the majority of women, a change of diet and getting more exercise will be enough to control gestational diabetes. For others, a form of medication such as tablets or even insulin may be required to keep blood sugar levels under control. As part of your treatment, you will need to monitor your blood glucose levels at various times through the day. In most cases, gestational diabetes is managed by diet and exercise and goes away after the baby is born. Very few women with gestational diabetes require insulin to control this type of diabetes. If you do need insulin, it will ensure blood glucose stays in the acceptable range, thereby reducing the risks to you and your baby. Gestational diabetes should not be taken lightly. Immediate risks to the mother and fetus are very real; however, these risks can be minimized with good care and follow up. Ante-natal care should be hospital-based, from a multi-disciplinary team. Individualise insulin regimens and recommend 4-times daily glucose monitoring. Aim to maintain glucose 4-7 mmol/L and HbA1c within the normal non-diabetic range. Ketoacidosis can cause fetal death at any stage. All women should test urine for ketones if blood glucose is high, if vomiting occurs or if they are unwell. The timing of delivery is individualised; in women with good diabetes control and no complications, the pregnancy may be continued to 39-40 weeks. Caesarian section rates are often higher than in non-diabetic women. Insulin requirements fall dramatically after you have given birth, therefore reduce insulin doses immediately to pre-pregnancy levels, to avoid hypoglycemia. 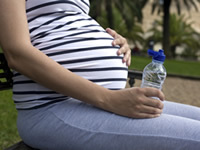 Encourage slightly higher blood glucose levels than during pregnancy. In breast-feeding mothers, reduce insulin dose further once lactation is established. Discuss contraception while the patient is still in hospital. All women should be seen by the diabetes pregnancy care team six weeks after delivery.